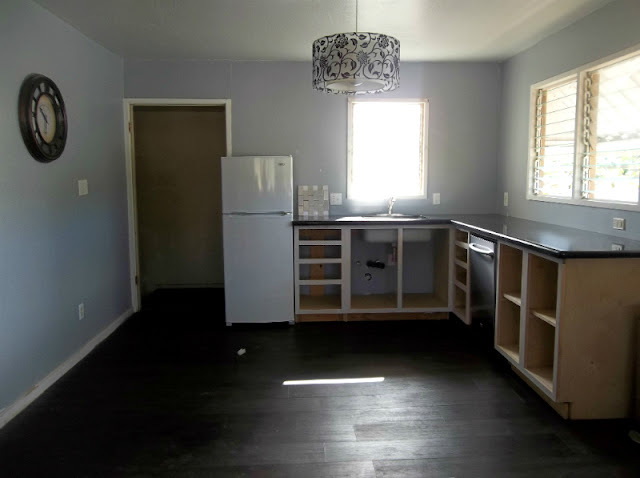 I love seeing before and after photos, but I value your time and would rather that you not peruse this entire page just to find an "after" photo that did not live up to your expectations. I do not have an "after" photo to offer, but I do have the most recent photo of our kitchen progress to date. My family helped me gut the kitchen in April, just days after the tenants moved out, but progress on the upstairs kitchen did not begin until September. Several things changed: illegal electrical hookups were solved, the windows were shortened to accommodate standard height cabinets that would also house a dishwasher, cabinets were built from $300 of plywood and lumber and $1,000 worth of labor (so far), which is much cheaper than the $7,000 price tag I was originally given for Thomasville plywood end cabinets! 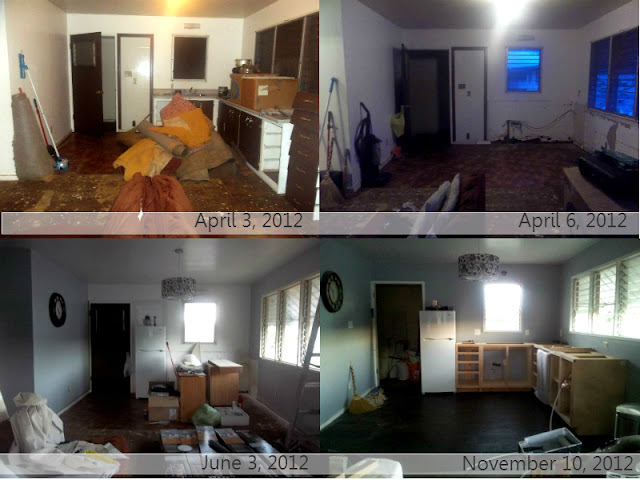 I replaced the kitchen light, painted, new floors were installed, and finally our kitchen counter was put in place as of December 14, 2012! Next: Install faucet, drain P-trap, dishwasher, garbage disposal, install tile backsplash, buy and install track light, finish whitewashing cabinet sides, install toe kick trim, make and attach drawers, doors, and pulls, paint window trim, make window screens, and install, build and paint dining table, console table, and find inexpensive dining chairs, make ledge shelving for additional storage.